Known as one of the most diverse cities in the country, Houston has been called “smart, skilled and soulful” and been dubbed “the American city of the future.” That’s a lot of praise, praise that we think it’s well deserved. Sure, most locals know H-town is “it,” but we may not be taking full advantage its awesomeness from day to day. 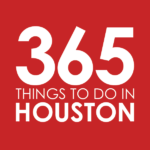 Enter our 50 Best Do Things in Houston list, a look at all the activities and destinations that belong on your Mutt City bucket list. And while we’ll always miss the days of AstroWorld (open 1968-2005), as well as the days of the Astrodome (fear not, there’s a comeback in the works! ), there are plenty of other experiences to be had, those both fresh-faced and with a taste of history. From bayou-side hikes and Asiatown food crawls to Downtown discoveries and tours of local music and art, here’s how to make the most out of your time in Houston, Texas. 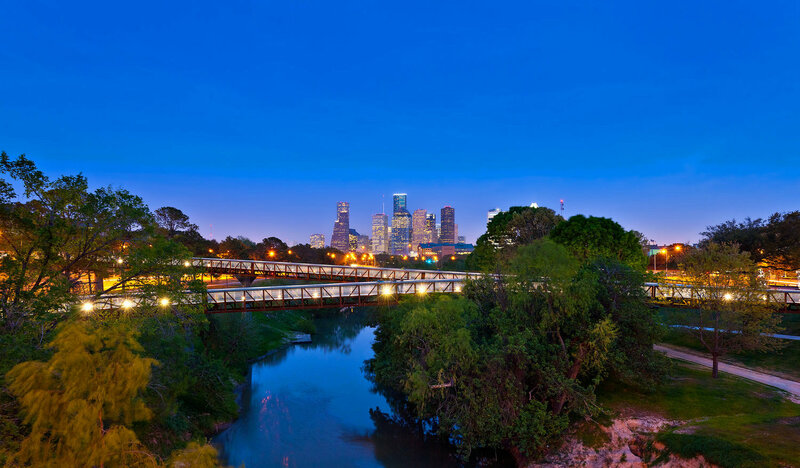 Stretching from Shepherd to Sabine, Buffalo Bayou Park offers 160 acres of picturesque scenery and skyline views. Visit the urban green space and you’ll discover hike and bike trails winding along the bayou; thought-provoking art installations hidden throughout; performance and outdoor activity spaces including Eleanor Tinsley Park, the Johnny Steele Dog Park and the Lee and Joe Jamail Skatepark; and a gorgeous, chandelier-lit kitchen and bar, The Dunlavy, where you can nosh on cheese boards, sandwiches and salads, breakfast plates, coffee, and wine. Look out for a lineup of fun events taking place at the park, from the annual Freedom over Texas fireworks on Independence Day to music, food, and beer festivals. Show off your Houston pride by cheering on one of our many home teams on Game Day. 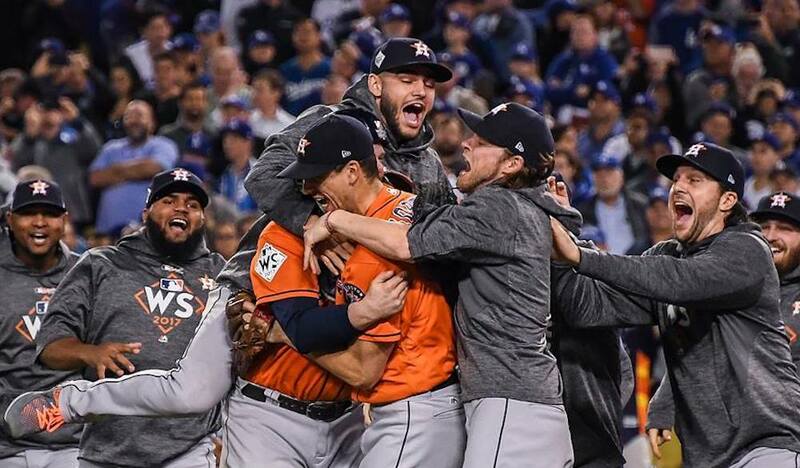 There’s the 2017 World Series Champions, the Houston Astros, playing at Minute Maid Park right in Downtown. 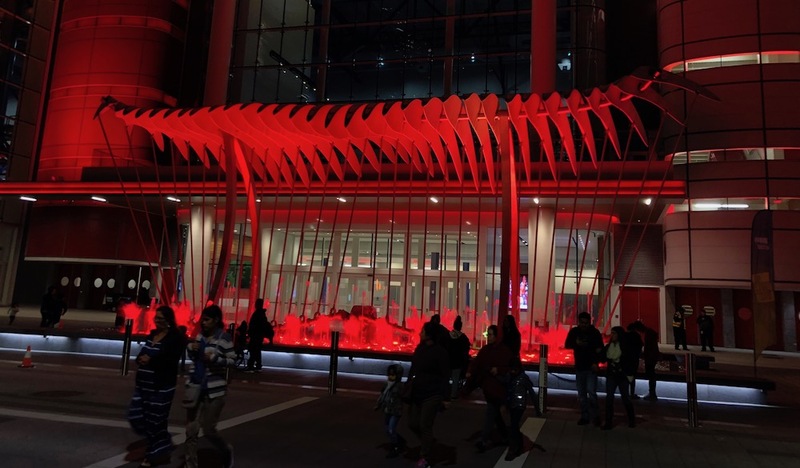 Nearby, you’ll also find the Houston Rockets shooting hoops and winning over the crowd at the Toyota Center. Just inside the southern edge of the Loop, NRG Stadium is home to football tailgates and the great Houston Texans and soccer fans can “go orange” for both the Houston Dynamo and the Houston Dash over at BBVA Compass Stadium in EaDo. Housing the esteemed Menil Collection art museum and lined by live oak trees and 20th-century bungalows, the eye-pleasing 30-acre campus is one of Houston’s crown jewels, providing a much-needed refuge from bustling city life. 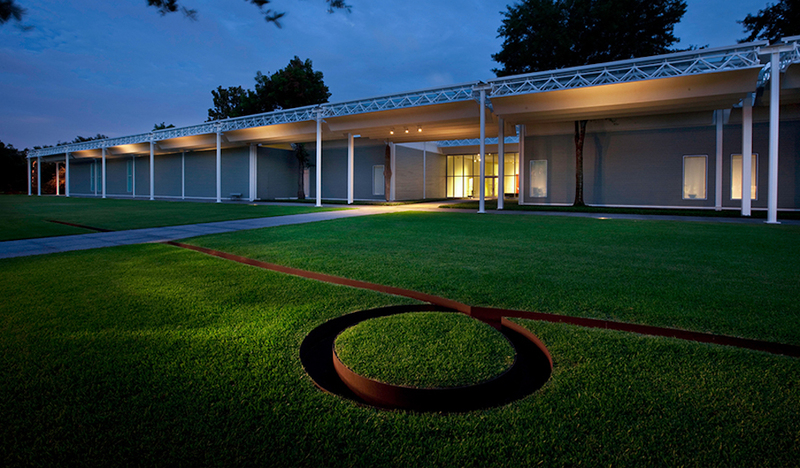 Start by walking the always-free museum’s halls and taking in the unmatched collection of its founders, John and Dominique de Menil. Continue the artistic journey with stops at the Cy Twombly Gallery and Dan Flavin Installation at Richmond Hall; and find solitude at the spiritual and open-to-all-faiths Rothko Chapel, a sleek, octagonal sanctuary that hosts 14 murals from abstract expressionist Mark Rothko, as well as eight movable benches (note: Rothko Chapel will be closed for renovations throughout much of 2019). Outside on the plaza, the Broken Obelisk rises above a reflecting pool; The sculpture is dedicated to Dr. Martin Luther King, Jr, who worked in service of social justice while leading a deeply spiritual interior life. Continue your exploration by walking the area for more art, relaxing green space, and nearby restaurants and bars. 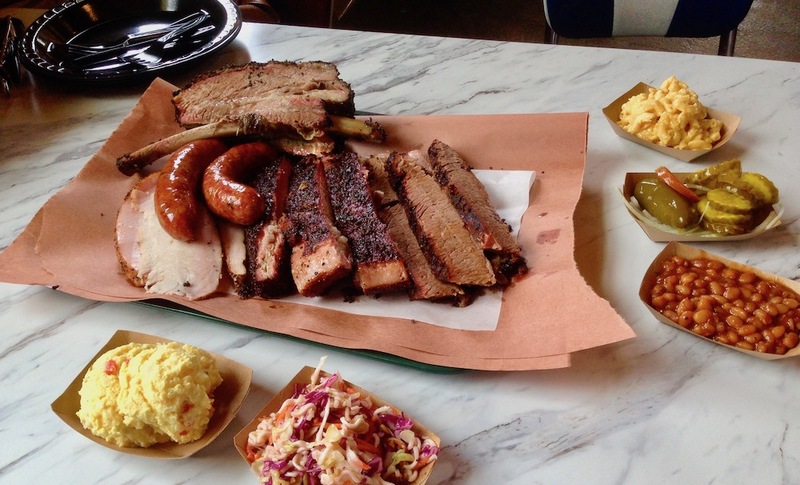 Houston is no stranger to great bbq (we are in Texas after all). Both Corkscrew BBQ in Spring and Tejas Chocolate + Barbecue in Tomball have been named in Texas Monthly’s “10 Best BBQ Joints in Texas.” Over in Pearland, Killen’s Barbecue smokes up the gold standard, with monster-sized beef ribs and fat-melting brisket (plus free kegs on to “assist” with any long waits in line over the weekends). In the Loop, you’ll find stars like Feges BBQ, The Pit Room, Pinkerton’s, and Ray’s BBQ Shack. ‘Q enthusiasts should also keep an eye out for annual events like the Houston BBQ Festival, typically held in April. Head to Shepherd School of Music at Rice University and you’ll find the magnificent Twilight Epiphany Skyspace. 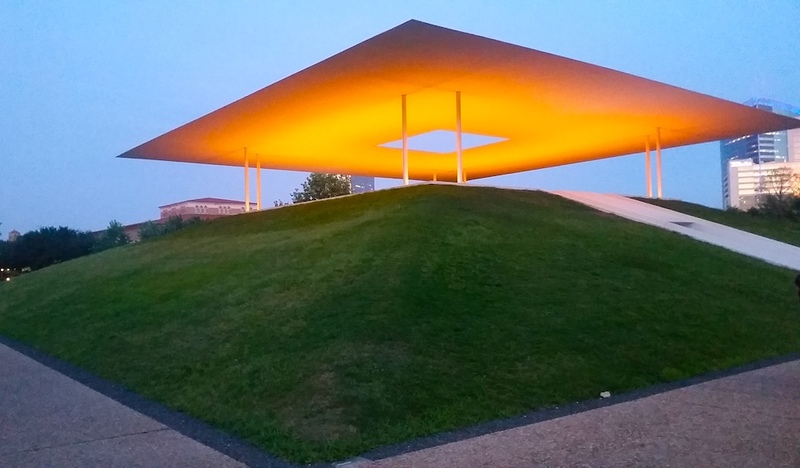 Built in 2012 and designed by brilliant artist James Turrell (also noted for his The Light Inside tunnel at the Museum of Fine Arts, Houston), the acoustically-engineered pyramidal structure is equipped with a LED light sequence that projects onto the roof and evokes the sun’s arc. The public is invited to view magical performances of light and sound, which occur at sunrise and sunset, on select days (reservations are free but required). 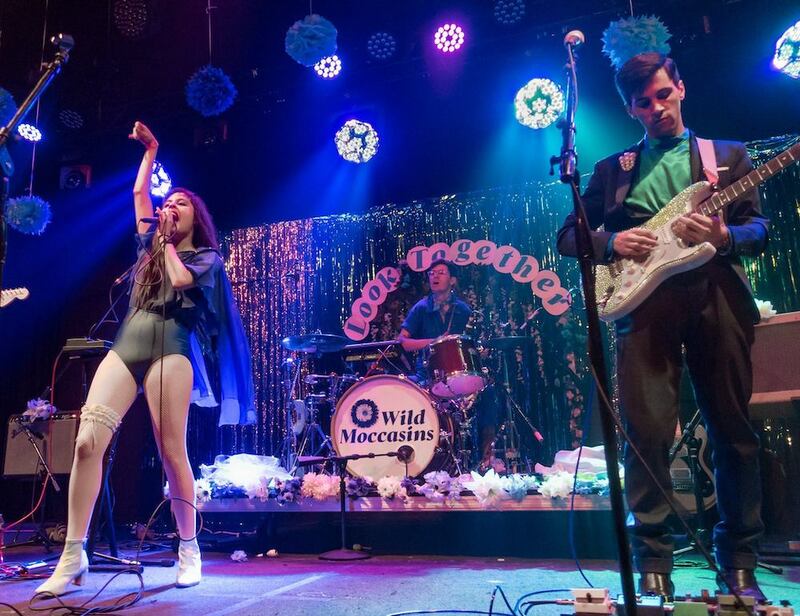 The city’s music scene is explosive, rocking a mashup of up-and-coming local acts, underground artists, and nationally-recognized musicians. Catch a concert at venues like White Oak Music Hall (with both indoor stages and a 2,000+ capacity open-air lawn), the impossibly cool Continental Club, the intimately charming The Heights Theater, and EaDo landmark Warehouse Live, plus larger touring venues like Revention Music Center and House of Blues in Downtown, The Cynthia Woods Mitchell Pavilion in The Woodlands, and Smart Financial Centre in Sugar Land. You can also enjoy smaller shows at authentic venues like McGonigel’s Mucky Duck in Upper Kirby and the up-and-coming local band-friendly Satellite Bar in EaDo. And be sure to keep an eye out on the seasonal lineup of free performances at Discovery Green and Market Square Park. Located at the southern end of the Museum District, Hermann Park is one of Houston’s most picturesque and iconic treasures. In addition to housing landmarks like the dazzling Mecom Fountain and Sam Houston Monument, the 445-acre park offers plenty of fun and relaxing ways to spend the day. Hit the tree-lined McGovern Centennial Gardens and you’ll find 8 acres of serenity, with a spacious central lawn, gorgeous Rose Garden, interactive Family Garden, and a sculpture promenade (walk around Hermann Park’s entirety and you’ll discover even more art in the park). Those looking to get zen can wander the stone paths of the Japanese Garden, a hideaway complete with cascading waterfalls and bridges, Japanese maples, cherry trees, crepe myrtles and more. 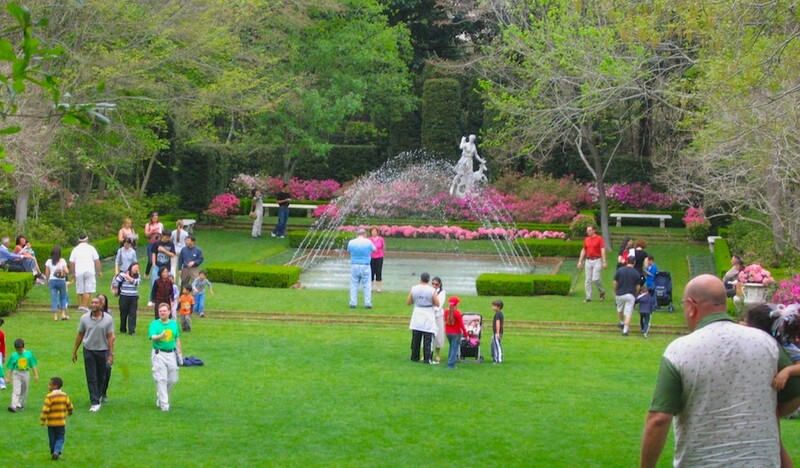 Both gardens are free to the public and open daily. Runners and walkers can check out the Marvin Taylor Trail, a picturesque two-mile path that offers the shade of historic live oaks, or the easy-on-the-eyes Mary Gibbs and Jesse H. Jones Reflection Pool; and those looking for a longer stroll can explore the scenic Bayou Parkland, an 80-acre oasis for native plants and wildlife nestled along Brays Bayou. 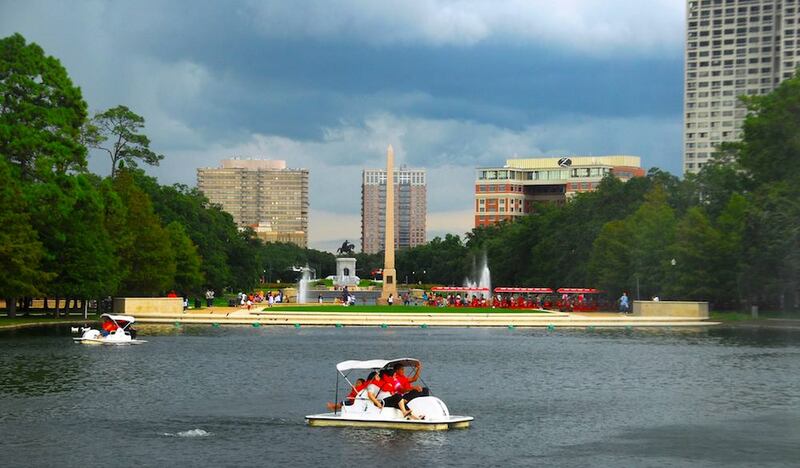 Parents of your kids will want to book a round trip for their families on the miniature Hermann Park Railroad, while all ages will enjoy renting a pedal boat on McGovern Lake. 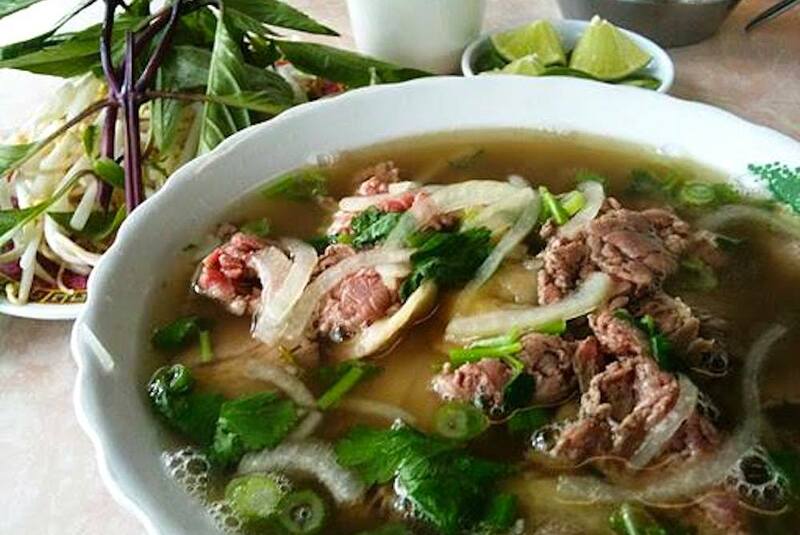 Known as one of the most diverse cities in America, it’s no surprise that Houston is a real-deal culinary melting pot. Our “Around the World in Houston” series highlights H-town’s vast array of cultures, and points you in the direction of where to find each culture’s most authentic eats—from Salvadoran pupusa and West African fufu to Persian tahdig and Singaporean chili crab. Pop around town and you can get a true taste of the globe. Local standouts include Indo-Pak spiced and fried chicken at Himalaya, South African bobotie and Portuguese-inspired espetada at Peli Peli, fragrant pho at Pho Binh, Peruvian ceviche and Argentinean churrasco at Andes Café, Polish golabki and hunter’s stew at Polonia, and dim sum at Fung’s Kitchen, to name a few. In November 2018, Houston Public Media debuted a food-centric half-hour special The Houston Cookbook featuring Houston chef David Cordúa, who explores the diverse, multi-ethnic flavors and dishes available to local foodies. Just southwest of Downtown, the Museum District is a beautiful section of Houston that plays home to an organization of 20 museums, galleries, cultural centers, and community organizations. Head to the pedestrian-friendly hood to find must-visit destinations, including the Houston Museum of Natural Science, The Museum of Fine Arts, Houston, the innovative Contemporary Arts Museum Houston, Asia Society Texas Center, Houston Museum of African American Culture, Holocaust Museum Houston and the Children’s Museum of Houston. Be sure to look out for free admission days as well as museums that are always free. 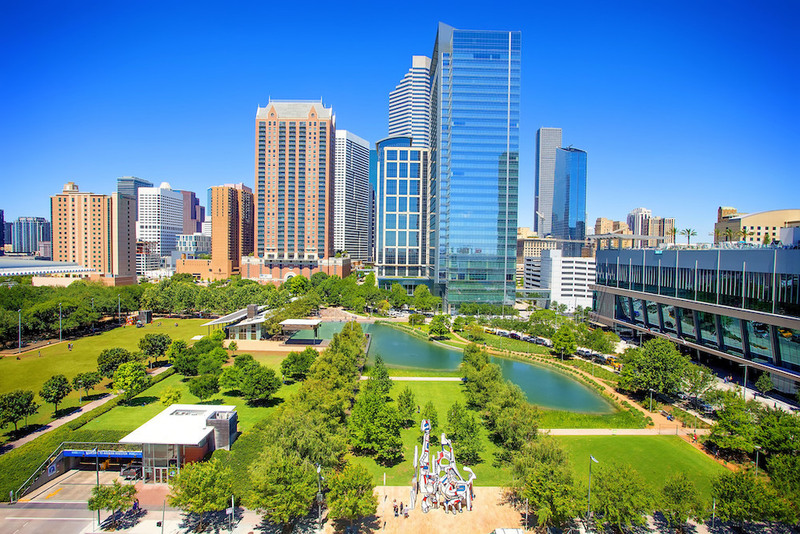 Nestled among Live Oaks in the heart of Downtown, the eco-friendly Discovery Green park has redefined the city’s urban landscape; and together with the revamped Avenida Houston, it has become a bonafide entertainment district. Escape the sun by strolling down the tree-shaded Brown Foundation Promenade, where you’ll also find seasonal art and annual winter light installations. On Jones Lawn, you’ll find a lineup of festivals, concerts and performances, and charity events. Discovery Green signature Kinder Lake covers over an acre of the park, offering activities like kayaking, stand up paddleboarding, remote-controlled sailboats, and ice-skating, depending on the season. And look out for other special events, including the ICE at Discovery Green outdoor skating park, Flea by Night pop-up flea markets, and community activities like yoga, workshops, movie screenings and more. Nearby, Avenida Houston offers a roster of bars and restaurants, events and concerts, and some pretty cool art, including Soaring in the Clouds, a 67-foot mobile of bird and cloud forms made of perforated stainless steel from artist Ed Wilson. 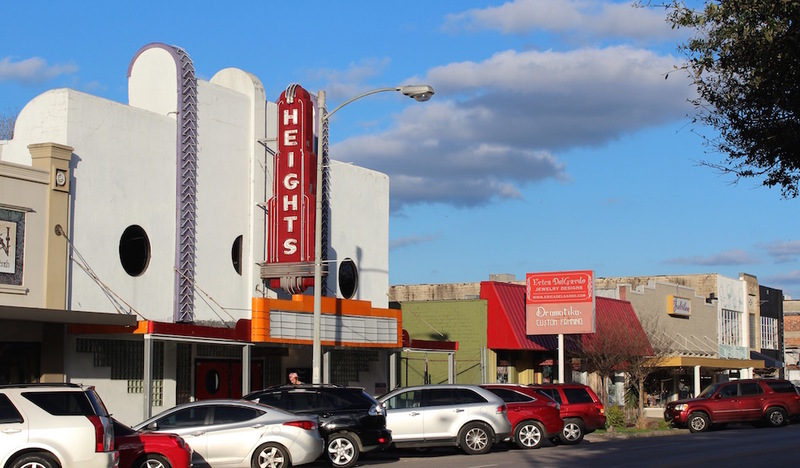 One of Houston’s quirkiest and coolest shopping districts lies on the vibrant 19th Street in the Heights. Packed with antique shops and galleries, thrift stores and boutiques, and cafes and restaurants, strolling the streets is the perfect way to spend a nice day. Be sure to look out for special events, from White Linen Night on the first Saturday in August, monthly Third Thursdays Sip & Socials, and tent sales and holiday tours. 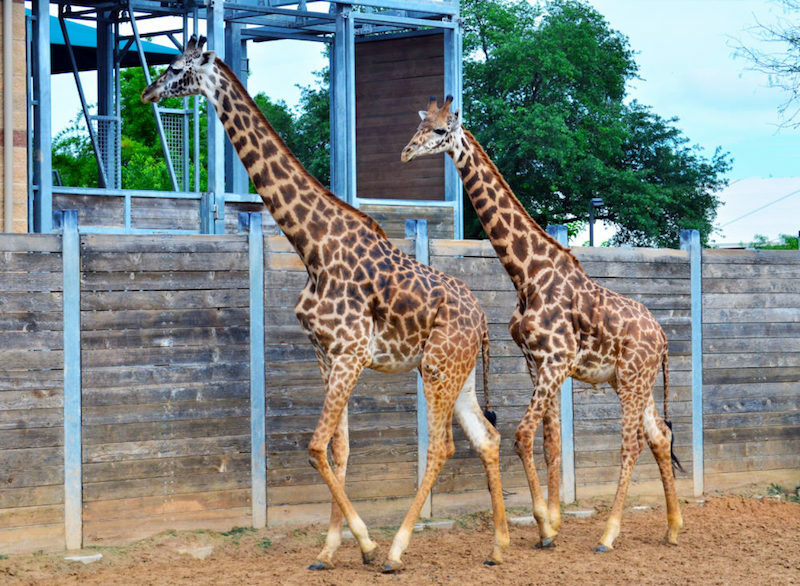 The 55-acre Houston Zoo hosts more than 6,000 animals in natural habitat-style exhibits, including tigers, cheetahs, elephants, gorillas and orangutans, warthogs, sea lions and more. Animal lovers can check out exhibits like the African Forest, Bird Habitats, and Reptile and Amphibian House, or feed giraffes at daily feedings held at 11am and 2pm. The zoo also hosts a lineup of fun programming throughout the year, from meet-the-keeper talks to fun annual events like the Halloween Night Prowl, Feast with the Beasts, and Zoo Lights, when the park decks its halls in more than 2 million twinkling lights for the holidays (from mid-November through early January). 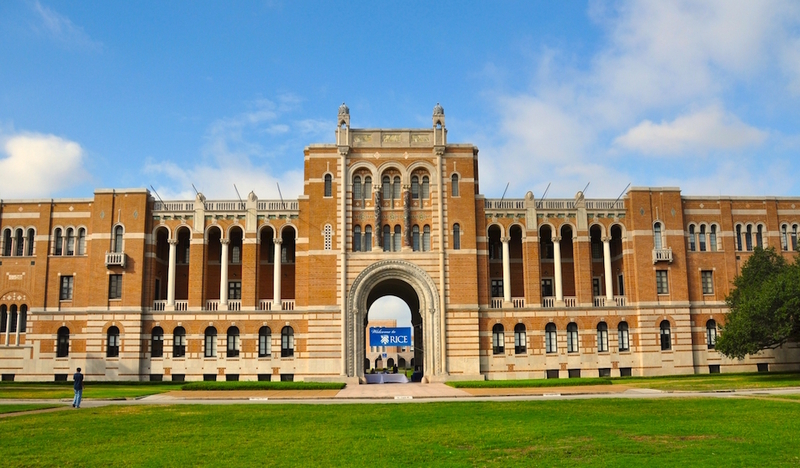 Take a walk through the beautiful 249-acre grounds of Rice University, where you can get cultured through theater and art, have a drink in a hidden bar, hunt for the university’s secret symbols, and run the oak-shaded 2.9-mile Rice University Loop running trail. At the University of Houston, experience visual and contemporary art exhibitions at the Blaffer Art Museum, enjoy performances at Cullen Performance Hall and the Moores Opera Center; or cheer on the Coogs. In Montrose, walking the grounds of the University of St. Thomas makes for a lovely afternoon, with highlights including the Chapel of St. Basil and historic Link-Lee Mansion, one of Houston’s architectural jewels. Brunching in Houston is a citywide pastime. Peruse our “Where to Brunch Series” and you’ll find a smorgasbord of lazy weekend food and drink, from the epic Sunday brunch buffet at Mexican hotspot Hugo’s to boozed-up brunch cocktails and fried chicken & donuts at Weights + Measures. 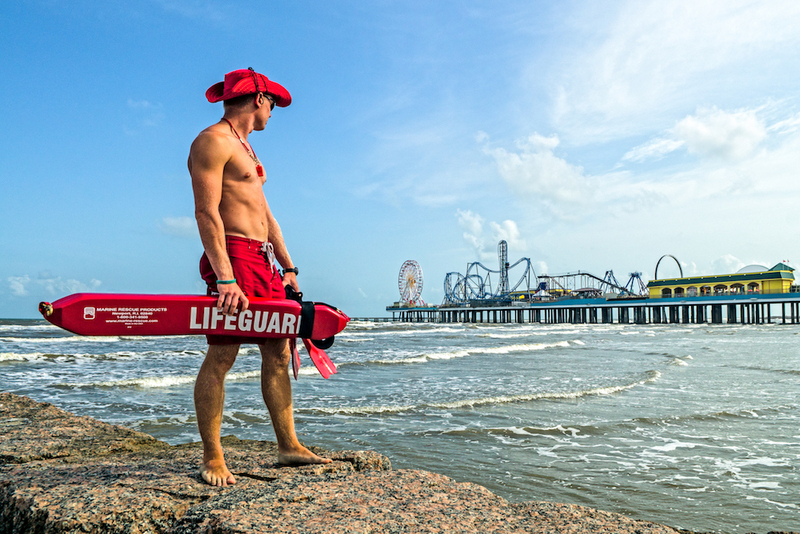 Just about an hour from Houston, Galveston Island harbors 32 miles of beaches, so you most definitely can (and should) dip your toes in the sand. It also plays home to two major fun zones like Moody Gardens and Schlitterbahn Waterpark. When you’re done with the water, explore the charming Historic Strand District in Downtown, which boasts a mix of shops, restaurants and bars, and beautiful Victoria-era buildings (don’t miss the water taffy and an old-fashioned ice cream soda at La King’s Confectionery); Saengerfest Park, where you’ll find a lineup of fun happenings; the Post Office Street Arts & Entertainment District, which houses the The Grand 1894 Opera House; and Pier 21, where you can dive into the history of the iron-hulled 1877 Tall Ship Elissa at the Texas Seaport Museum. Nearby attractions also include Bishop’s Palace, Ashton Villa, and Moody Mansion. 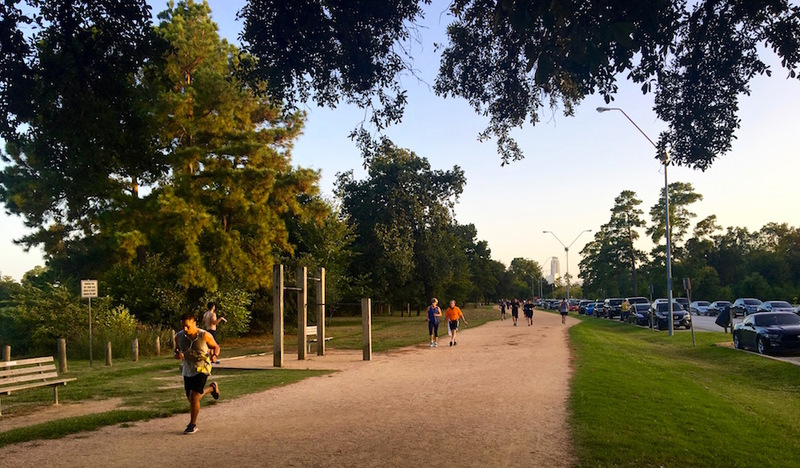 Even in Houston’s hottest months (we’re looking at you, August), you’ll find dedicated locals making their rounds of Memorial Park’s three-mile loop. Lace up and hit the track, or explore the park’s thirty miles of hiking (and biking) trails. But trails aren’t all this 1,466-acre park has to offer. There are also softball fields, sand volleyball, tennis, and croquet courts, free space for pick-up flag football and soccer games, a driving range and 18-hole Memorial Park Golf Course, swimming lanes at the Memorial Park Fitness Center, and onsite burger joint, Becks Prime. And the park’s future looks even better. After a $70 million grant from the Kinder Foundation, the visionary park’s Master Plan will be fast-tracked, with upgrades focusing on connectivity and access, protecting and enhancing its green infrastructure, preserving natural resources, revealing Houston’s history, and improving recreational assets and amenities. With just Lone Star and Shiner on tap, the cash-only Alice’s Tall Texan is a true Texas dive. Over in the East End, D&W Lounge was named one of the “Eight Great Dive Bars of Texas” by Texas Monthly. And the iconic West Alabama Ice House is where you want to be on a lazy afternoon. Grab some cheap tacos al pastor at the neighboring Tacos Tierra Caliente food truck, then wash them down with an ice cold beer. Whiskey more your thing? Check out Poison Girl; the Montrose hangout rocks a badass collection of American whiskies (and pinball). 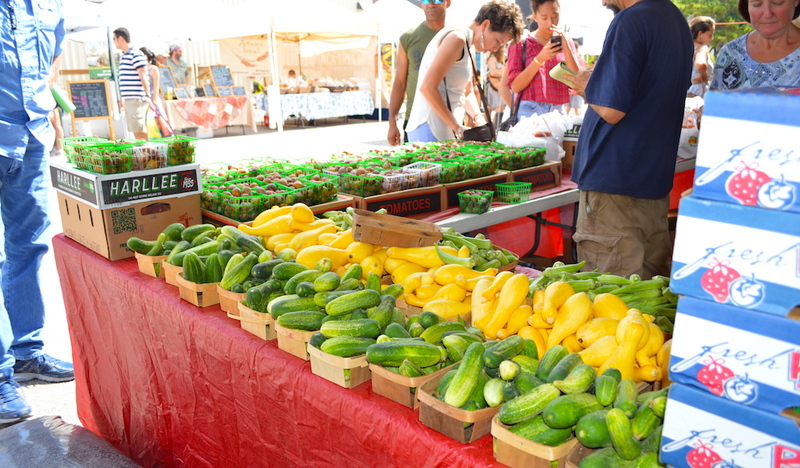 Set your alarm for this year-round farmers market, which runs from 8am to noon, rain-or-shine, at its new location at St. John’s School off Buffalo Speedway. The market has been championing small, local farms and businesses since 2004, and today, it’s bigger and better than ever. Packed with fresh and organic produce from new and multi-generation farmers, local artisans crafting everything from seasonal jam and crusty bread to luxurious soaps and fresh-cut flowers, stands fulfilling your morning needs with hot coffee and breakfast tacos (and cupcakes! ), and a lineup of live music and demos from Houston’s top culinary talent, it’s the place to be on Saturday mornings. Urban Harvest also pops up around City Hall on Wednesdays in the spring and fall. Break out the wallet and head to Houston’s finest shopping districts. In the Galleria area, The Galleria shopping mall draws 30 million visitors annually, housing 400 fine stores and restaurants, two hotels, and a full-size ice skating rink. Nearby, Highland Village offers retailers from Vineyard Vines and BHLDN to Restoration Hardware and Crate & Barrel. 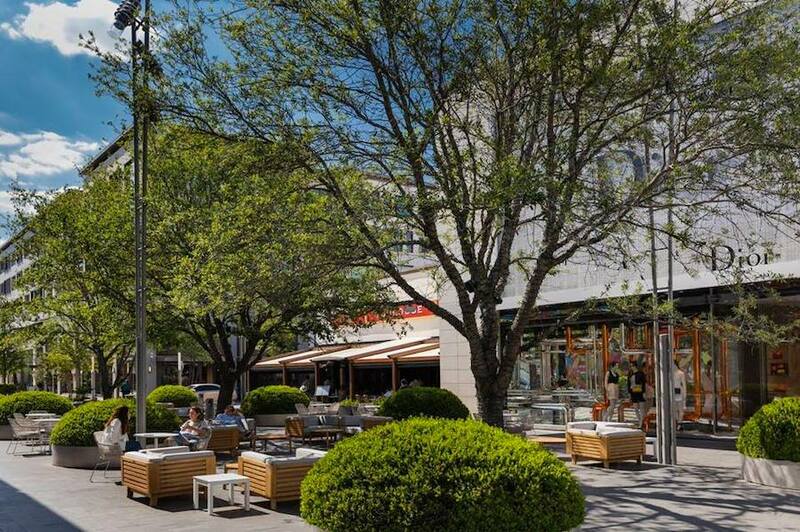 And the shiny new River Oaks District is a luxury fashion playground, with trendsetting stores including Alice + Olivia, Hermès, Canali, and Tom Ford. 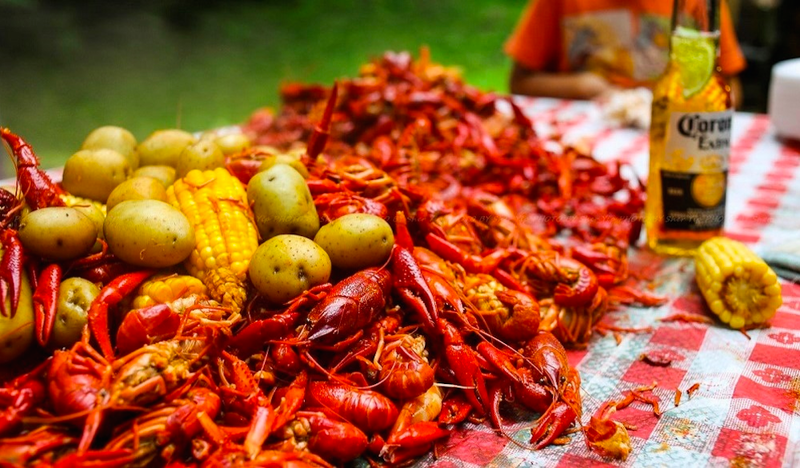 If we could pick one thing that makes you a true local, it’d be knowing how to peel, pinch, and eat your weight in mudbugs. Here, you’ll find the fresh boiled and Cajun spiced, or tossed in garlic-butter in a mashup of Vietnamese and Cajun style that feels wholly Houston. Check out fan-favorite crawfish spots like BB’s Cafe, Crawfish & Noodles, Boil House, and Cajun Kitchen. Sure it’s a bit touristy, but Space Center Houston is a landmark destination for a reason. 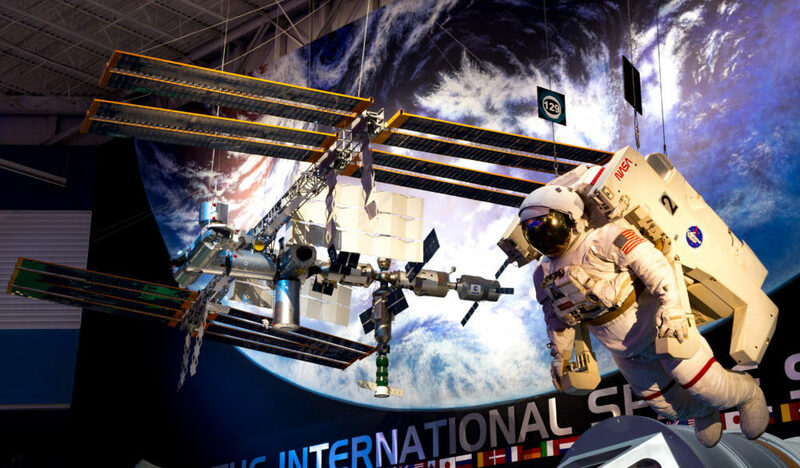 The Space City attraction offers out-of-this-world exhibitions, with chances to touch a moon rock, go behind the scenes of NASA and see Mission Control, and see Saturn V, the tallest, heaviest and most powerful rocket ever flown. Fact: You’re not a Houstonian until you’ve enjoyed a free show at this striking outdoor theater, which becomes even more striking once illuminated at night. 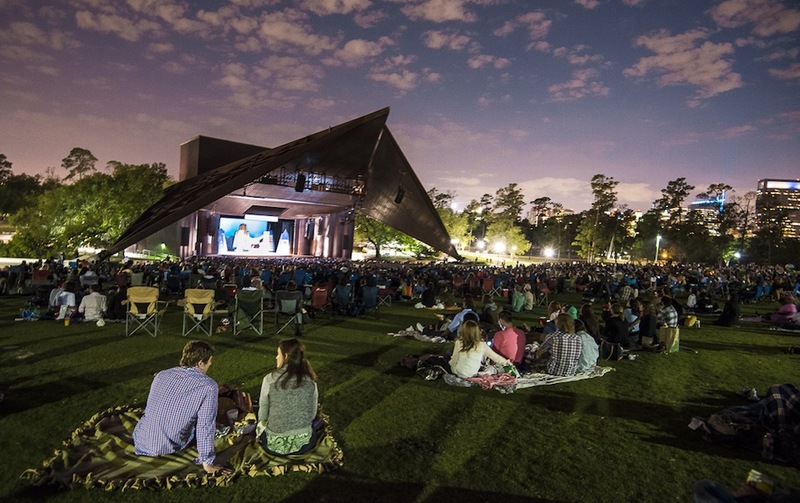 Located in Hermann Park, Miller puts on and hosts a variety of programming each year, ranging from children’s productions and a yearly Shakespeare Festival to performances from the Houston Ballet and popular concert artists. Bring a blanket or a chair, grab some snacks from the concession stand, and enjoy the show. Covered seating is also available for free, with some evening shows requiring tickets for covered seating. Those tickets can be claimed at the box office in person, first come first served on the morning of the show. 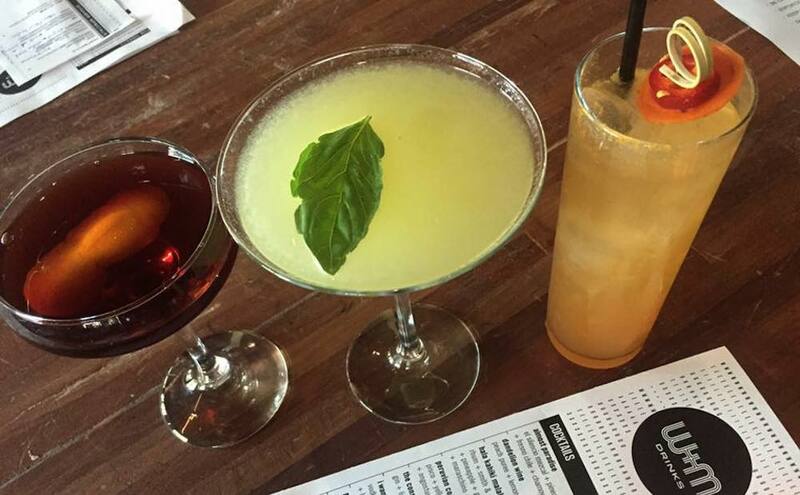 Houston’s cocktail scene got a kickstart when drink kingpin Bobby Heugel opened Anvil Bar & Refuge in 2009. 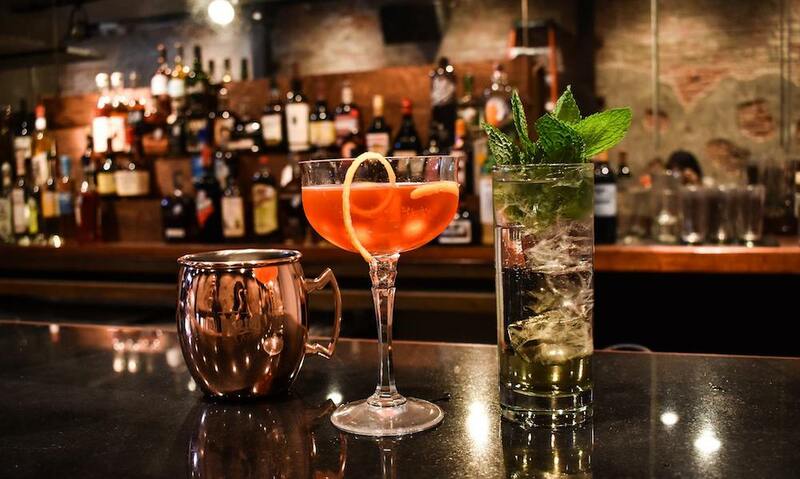 Since then, classic and innovative cocktails have absolutely taken over the city. Get traditional Southern concoctions (like the namesake Julep) at Julep; pair classics with stellar music at The Cottonmouth Club; go full-on Tiki at the rum-soaked Lei Low; and get into the good kind of trouble with coffee-infused artisan cocktails at Double Trouble Caffeine & Cocktails. Tacos are acceptable any time of day in Houston, from morning ‘til late night. 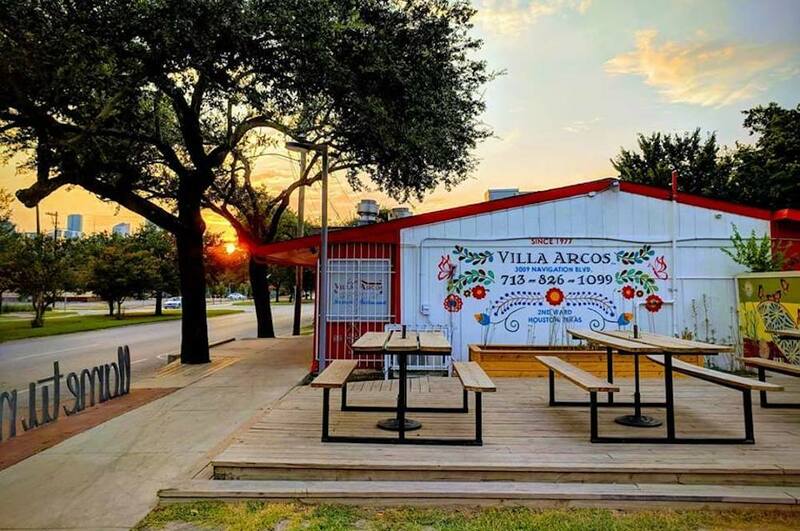 For breakfast, get fat and fluffy tortillas stuffed with huevos, chorizo, and papas at early morning haunts like Villa Arcos, Luna Y Sol Mexican Grill, Brothers Taco House, and Laredo Taqueria. Later, get carnitas, barbacoa, lengua, and tacos al pastor at favorites including Tacos La Bala, Tacos Tierra Caliente, La Macro, Taco Keto, and late-night spots like La Calle and El Rey. Our team is pretty partial to Taco Deli on Washington Avenue, known for locally-sourced and organic ingredients, as well as the El Pastor taco (be sure to also order an off-menu side of avacado sauce to make it perfection) at Tacos a Go Go in Midtown and The Heights. And since Taco Tuesday is a real thing here, be sure to check out our list of Taco Tuesday deals. 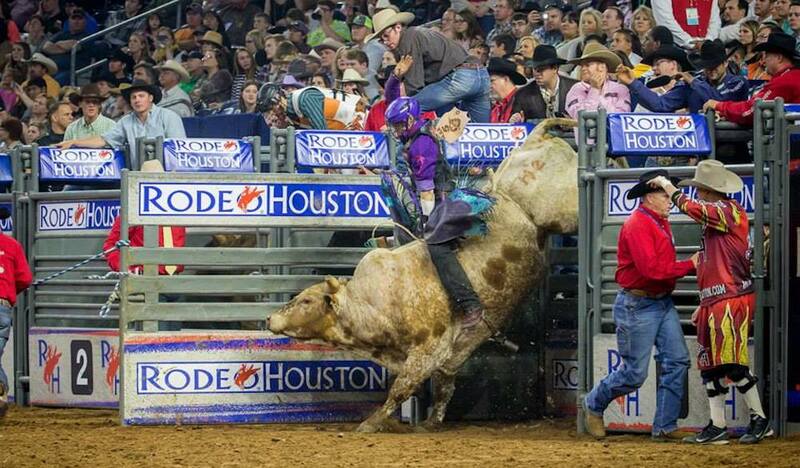 For many locals, the Houston Livestock Show & Rodeo is one of the biggest highlights of the year. Kicking off with pre-rodeo competitions like World’s Championship Bar-B-Que Contest, the show brings barrel racin’, two-steppin’, mutton bustin’, bull ridin’, and a lineup of live performances from top country artists and more every year around early March. 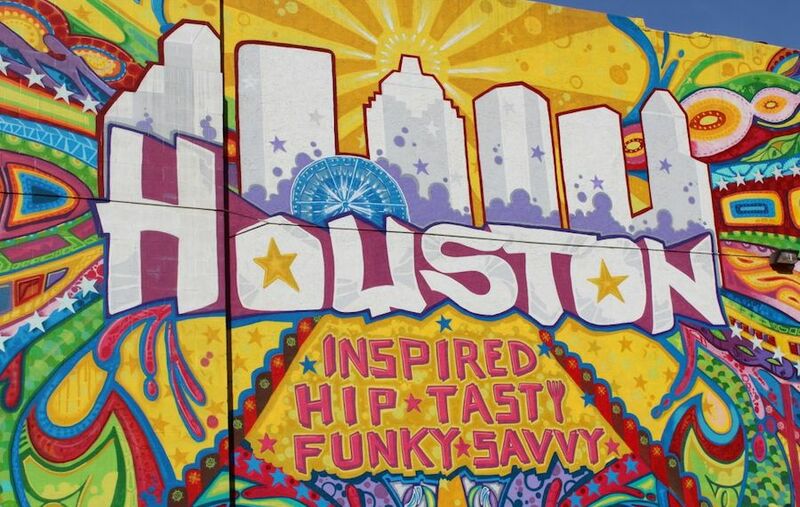 Break out your cowboy boots and see why the HSLR should be on everyone’s Houston bucket list. 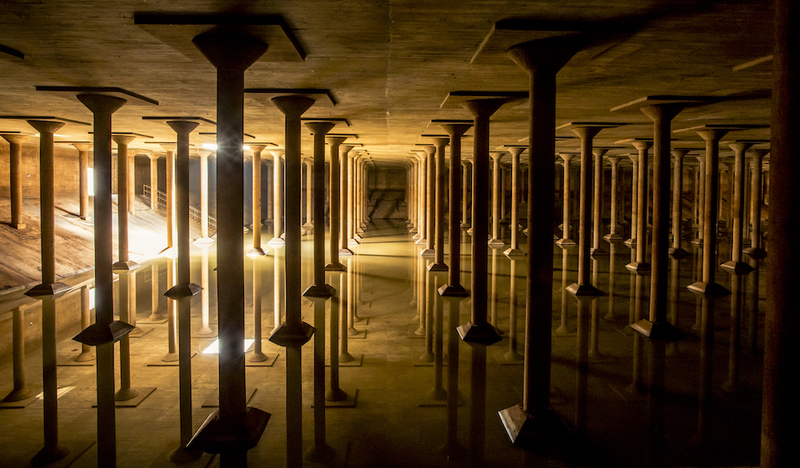 Formerly a drinking water reservoir built in 1926, The Cistern at Buffalo Bayou Park was much forgotten about after it was closed due to an irreparable leak. 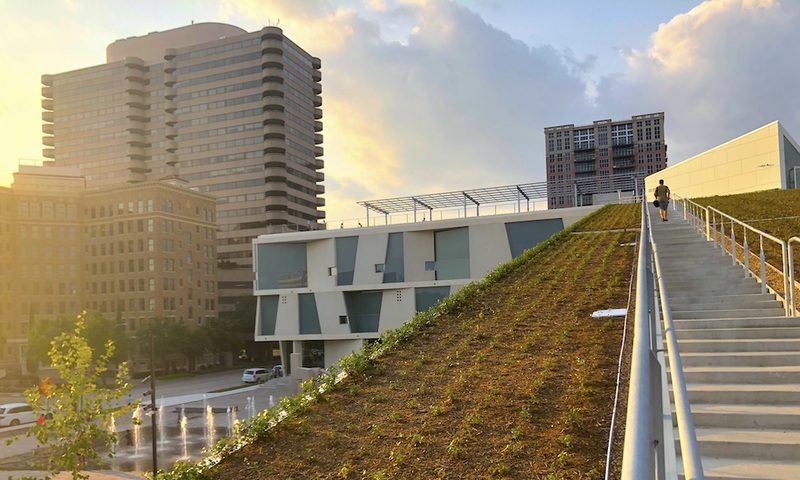 That is, until 2011, when the Buffalo Bayou Partnership re-discovered the 87,500 square foot, 25-foot tall cavernous space during the development of the Buffalo Bayou Park. 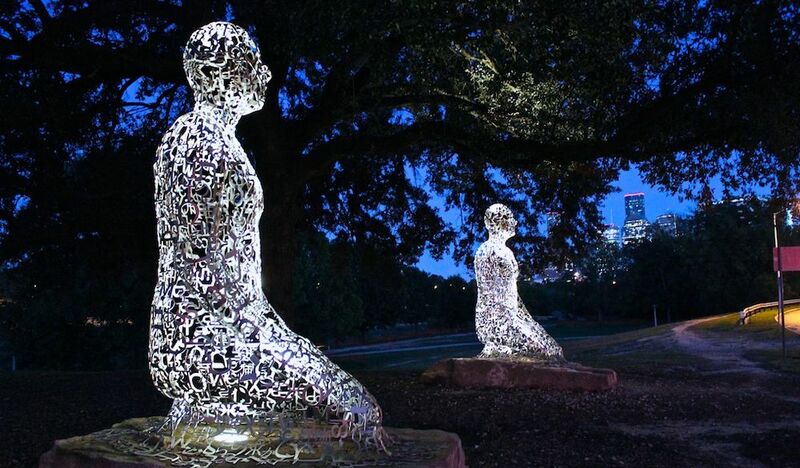 Realizing its architectural splendor and historical significance, they worked with the City of Houston to open the industrial relic to the public, even hosting a series of art and light installations and guided meditations. You’ll have to make reservations to get a look, and you should. The 30-minute docent-led tours are available every Wednesday to Sunday. Tickets are $8 to $10 per person; no children under the age of 9 permitted. Patio bar life is a way of life in Mutt City. Speaking of mutts, many of these patio spots allow you to bring your pups (or make friends with some new four-legged friends while you’re there). 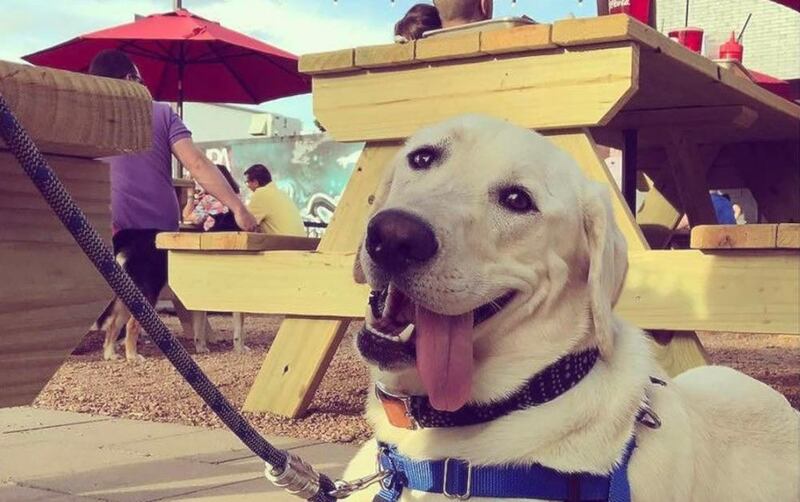 That’s thanks to the grassroots movement Paws on Patios, which achieved its objective in giving Houston bars and restaurants the option to allow dogs on their outdoor patios in 2011. Bring Fido to Heights Bier Garten or Axelrad Beer Garden, where you can hang out in a hammock with a craft beer while your pup people-watches; check out the sprawling outdoor spaces at spots like Cottonwood in Garden Oaks, Little Woodrow’s in Midtown and beyond, and Kirby Ice House in Upper Kirby; or enjoy a meal at pup-friendly eateries like FM Kitchen & Bar off Washington Avenue or The Burger Joint in the heart of Montrose. 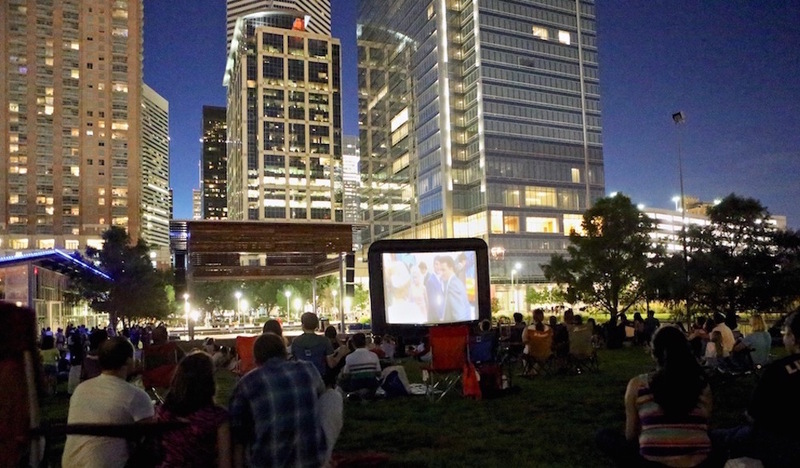 We can thank the Houston weather for allowing outdoor movie screenings throughout the year. Bring a blanket or lawn chair for the free outdoor screenings at spots like Market Square Park, Discovery Green, the Lawn at Memorial City, and Sugar Land Town Square; or buy a ticket for the new Rooftop Cinema Club in Uptown, where you can catch classic flicks on the roof deck alongside stunning sunsets and panoramic views of the city. 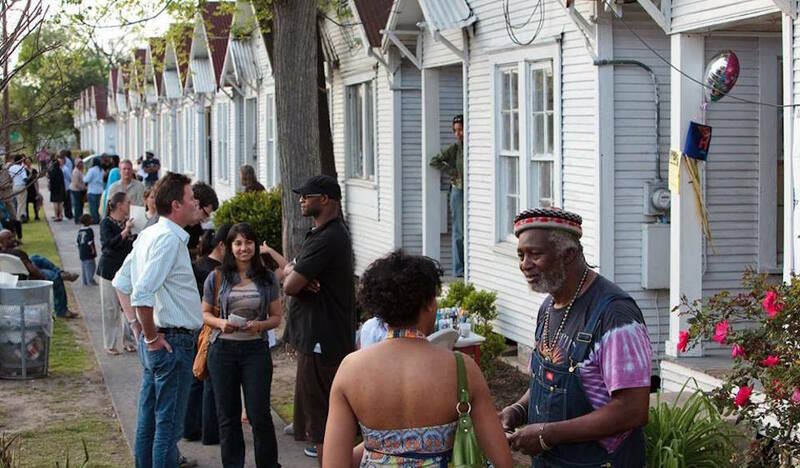 Founded in 1993, this awesome community-based arts and culture organization transformed a group of shotgun houses into creative art studios. Today, the Project Row Houses organization continues to showcase some truly incredible local artworks while preserving, revitalizing, and empowering one of the oldest African American neighborhoods in the city. The space is open to the public Wednesday through Sunday from noon to 5pm. Set in Downtown, the majestic Theater District features a mosaic of artistic performance venues, as well as bars, restaurants, and family-friendly attractions that are all just a stone’s throw away. Enjoy some cultured time at theaters including Wortham Theater Center, housing both the Houston Ballet and the Houston Grand Opera; Jones Hall, the permanent home of the Houston Symphony and the Society for the Performing Arts (SPA); Hobby Center for Performing Arts, boasting two acoustically distinguished theaters with performances companies Broadway at the Hobby Center series and local musical company Theater Under the Stars (TUTS); and Alley Theatre, home to a resident company of actors and offering an array of innovative productions—from classics and underrated plays to modern premieres. If you’re going to treat yourself to a nice meal, you should probably do it at a restaurant that is considered a Houston elite. At chef Hugo Ortega’s Xochi, set in the Marriott Marquis on the edge of Discovery Green, the vibrant flavors of Oaxaca, Mexico shine through a mosaic of moles and masas, alongside a stellar bar program and housemade chocolate. Uchi is where you’ll want to be for razor-sharp cuts of sashimi and innovative Japanese dishes; and the omakase tasting at MF Sushi is top-notch. Spanish fine-dining and the tastes of Barcelona are on display at the elegant BCN Taste & Tradition; Italian fare is garden fresh at Coltivare; and if steak is your thing, try standouts like Pappas Bros. Steakhouse, Doris Metropolitan, and Georgia James. For a tasting menu that is as thoughtful and invigorating as it is tasty, enjoy an evening at The Pass; or get elegant fine dining hospitality and plenty of charm at old-school favorites like Tony’s and Brennan’s of Houston. 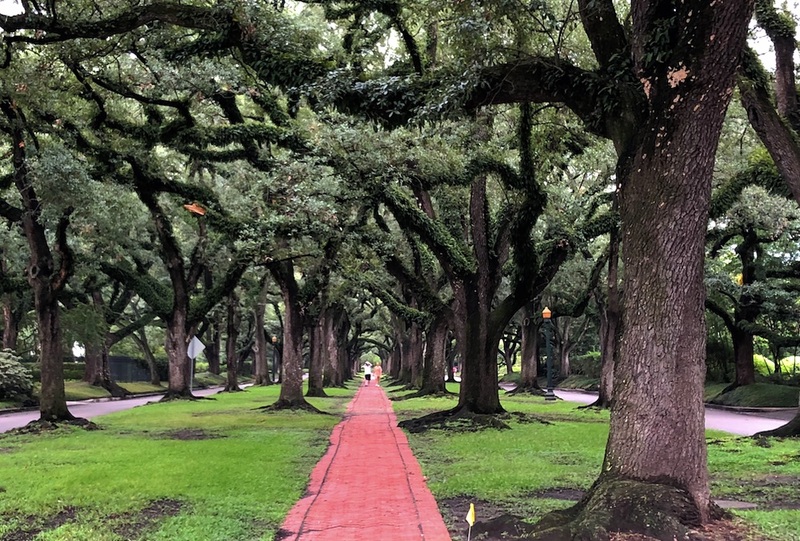 Located off Bissonnet near Rice University, this charming neighborhood is known for its prized, Oak-shaded esplanades along North and South Boulevards. Its homes are preserved and beautifully restored bungalows and mansions from the 1920s and ’30s, making it a must visit for a quick stroll and snapshot. Our Downtown is stacked with mini-districts to explore. Besides the aforementioned Discovery Green and Avenida Houston, you can also head to the Historic Market Square, where you’ll find bars (including some of Houston’s oldest, Warren’s Inn and La Carafe, restaurants, and Market Square Park, rocking beers and gyros at the Niko Niko’s stand as well as plenty of space for outdoor activities, including Blanket Bingo, movies under the stars, pop-up concerts, and more. Nearby, take a stroll down Main Street, where the MetroRail zips through and bars and restaurants line the street. Pop into Captain Foxheart’s Bad News Bar & Spirits Lodge for a drink and views from the terrace, sip tequila and mezcal-laced numbers at The Pastry War; go big on beers at Bovine & Barley and Flying Saucer; and grab a meal at Local Foods or Bombay Pizza, a bit further down. And on the east side of Downtown, the hot neighborhood known as EaDo is definitely worth a visit. Known as the “Art & Soul of the City,” it rocks entertainment venues, art installations, and a solid roster of food and drink. 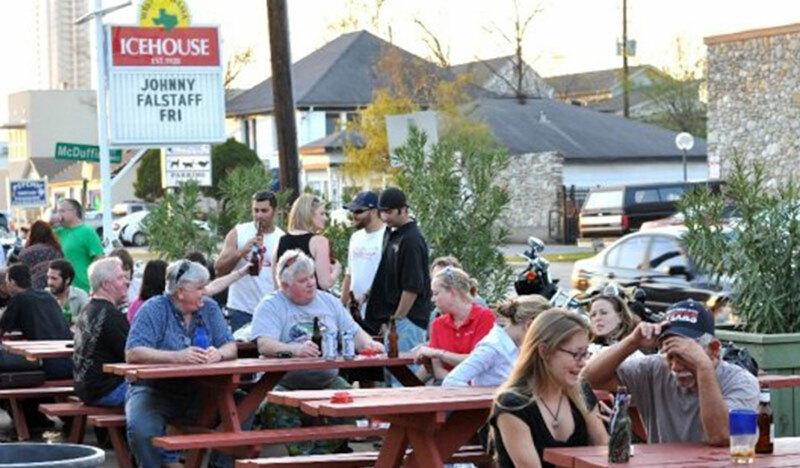 Catch standup at The Secret Group or a concert at Warehouse Live; grab a slice of pizza at Vinny’s or burgers at Rodeo Goat, then hit the patio at Truck Yard; or share delicious plates at hotspots like Nancy’s Hustle and Indianola. This fresh-faced Arts District enriches the culture of Houston via creative studios and galleries, dining and shops, public art installations, and more. At its heart is Sawyer Yards, a creative campus spanning over 55 acres of industrial warehouses and featuring art spaces including The Silos, Silver Street Studios, Spring Street Studios, Summer Street Studios, and Winter Street Studios. On the second Saturday of each month, Sawyer Yards hosts its “Second Saturday” event, as local artists open their studios to the public. Spend the afternoon wandering through the repurposed warehouses to discover paintings and sculptures, jewelry and clothing, photography and printmaking, textiles, mixed media and more. 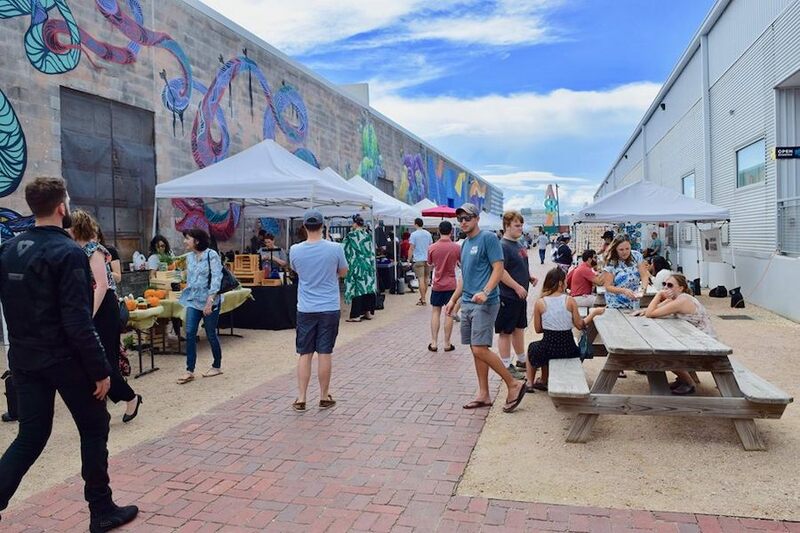 On second Saturdays, you’ll also find The Market at Sawyer Yards, featuring folk art, artisan crafts, and specialty foods. Both events are free and open to the public. Houston’s craft brew scene has positively exploded in the last few years, but it all started with Texas’ oldest craft brewery, Saint Arnold Brewing Company, in 1994. Today, the patron saint of beers has expanded to include a sprawling beer garden and restaurant, in addition to its beer hall, brewing facilities, and a lineup of tasty suds—from year-rounds like the clean Fancy Lawnmower and bright & hoppy 5 O’Clock Pils to seasonal standouts like Pumpkinator and Oktoberfest. 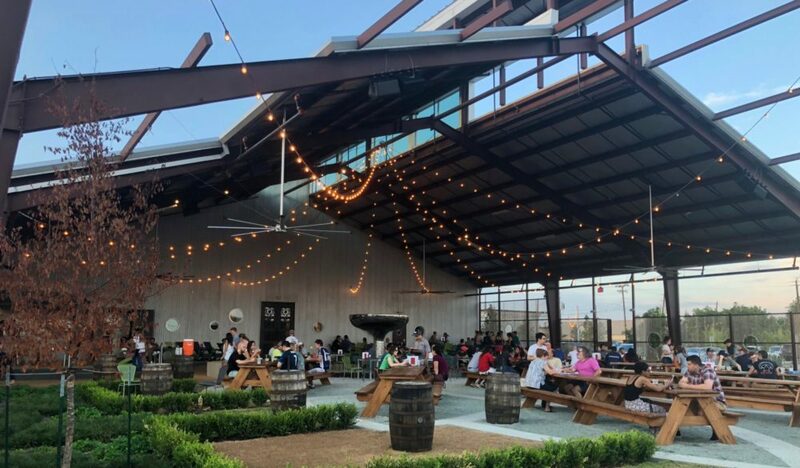 8th Wonder Brewery is another local fave, rocking a WonderWorld outdoor beer garden and fun zone alongside taps of Dome Faux’m cream ale, Hopston Texas IPA, and Rocket Fuel, a Vietnamese coffee porter that fits right in H-town. But don’t stop there. Click here for our full list of 22 Greater Houston breweries stretching from Galveston to Conroe. Just 20 miles from Downtown on Galveston Bay, Kemah is a breezy escape from the city. And its most popular attraction is Kemah Boardwalk, offering a taste of the charming boardwalks of the East Coast. 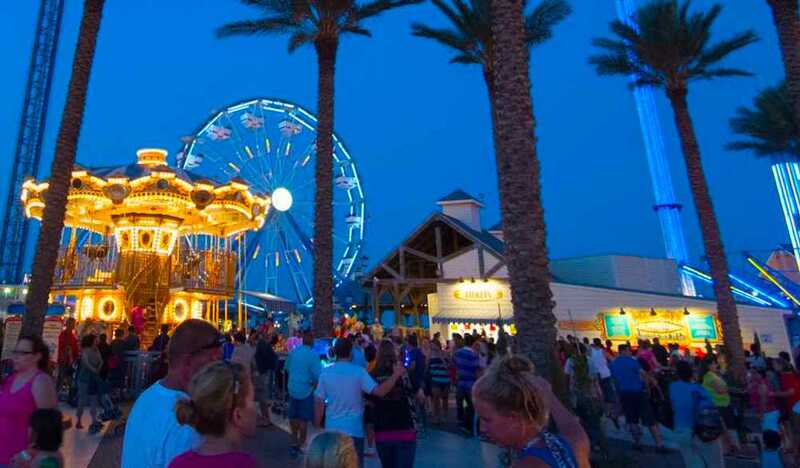 Open daily, it boasts amusement park rides, Gulf Coast eats, live tunes, charming shops, and funky festivals. Take a ride on the Ferris wheel, swing high above the ground on the Aviator, test your fearlessness on the 140-foot Drop Zone or Boardwalk Bullet, and experience the water with a ride on the Boardwalk Beast, a thrilling 25-minute boat ride through Galveston Bay (just don’t expect it to be dry). Or head straight to Galveston’s Historic Pleasure Pier, where you’ll find family-friendly fun on rides like the Iron Shark Rollercoaster, sky-high Texas Star Flyer, and swinging Gulf Glider, plus a 5D theater ride, games from ring toss to hoops, and classic boardwalk eats like fried shrimp, burgers, pizza, cotton candy, and ice cream. Also known as Chinatown, Houston’s Asiatown is home to a thriving community filled with shops, restaurants, and plenty of awesome things to do. 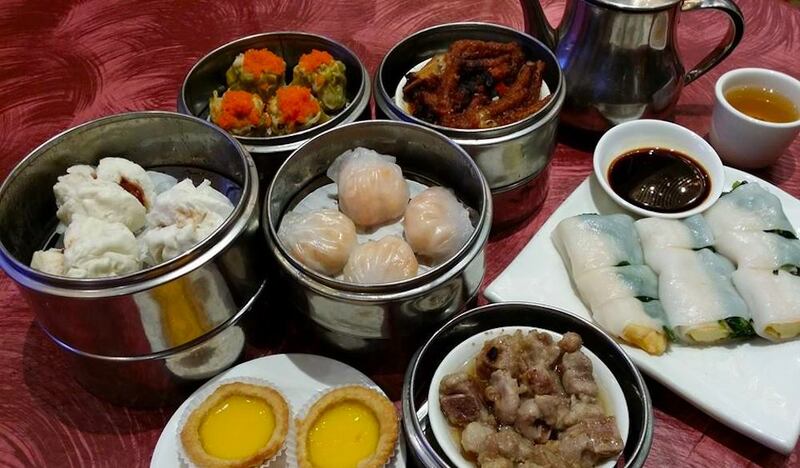 Explore the globe via your stomach at cult favorite spots like Mala Sichuan, Banana Leaf, Saigon Pagaloc, Peking Cuisine, and FuFu Café; check out newer spots including Tiger Den, Shabu Zone, Mein Restaurant, and 85°C Bakery Cafe; hit the Hong Kong City Mall to check out a multitude of fashion, gift, music, toy, and home goods shops, plus over 20 restaurants and cafes and the bustling Hong Kong Food Market; sing your heart out at a BYOB karaoke; bargain hunt on Harwin Drive; and finish up with a relaxing reflexology massage. Be sure to look out for our brunch and happy hour options. 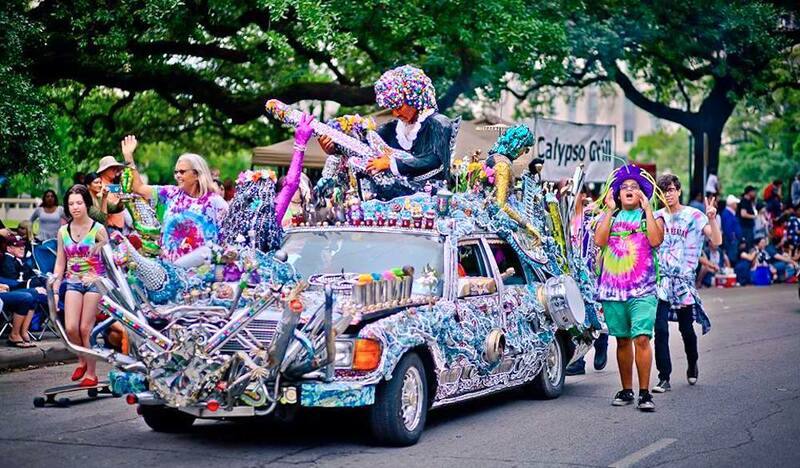 Houston is quirky, as seen by all the local love for the wacky works of art-on-wheels known as Art Cars, an artistic movement fusing the traditions of fine, folk and public art. You can find those works rolling through the streets during the annual Houston Art Car Parade, typically held in April; or on display at Houston Art Car Museum—aka “Garage Mahal”—year-round. Can’t get enough? Check out the art cars at Saint Arnold Brewery, too. And tack on an Art Car IPA for good measure while you’re there. 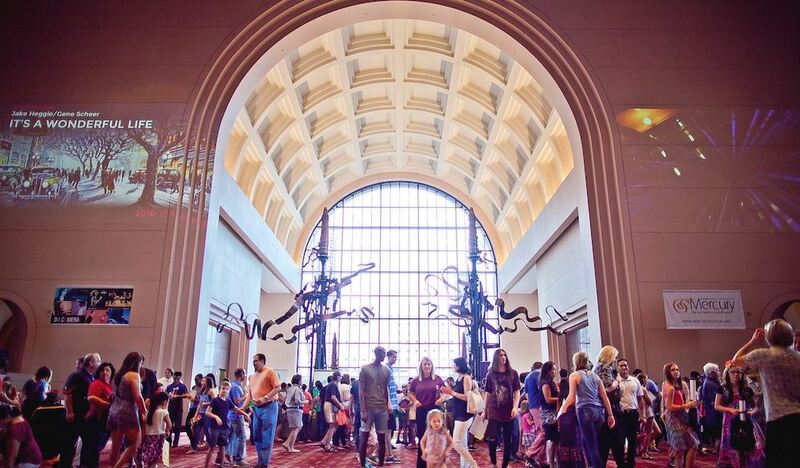 One of the best ways to explore Houston is on wheels, and we don’t mean your car. 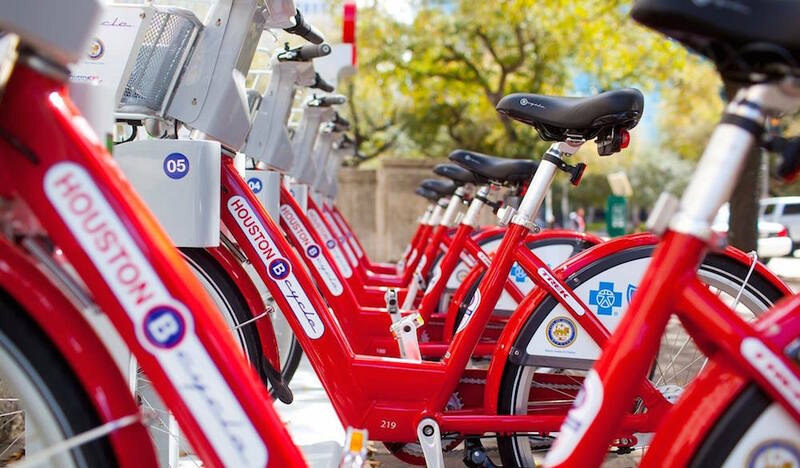 The Houston BCycle program allows you to access the city by renting a bike from one of its growing list of 80+ stations, with mini-networks in hoods including Downtown, Midtown, Third Ward, East End, Near Northside, The Heights, Buffalo Bayou, the University of Houston campus, and Rice University and Rice Village. Just pick up a bike, ride safe, and dock back at any station. Walk-up rides run $3 per 30 minutes, or you can sign up for a monthly membership to unlock unlimited hour-long trips for $9. 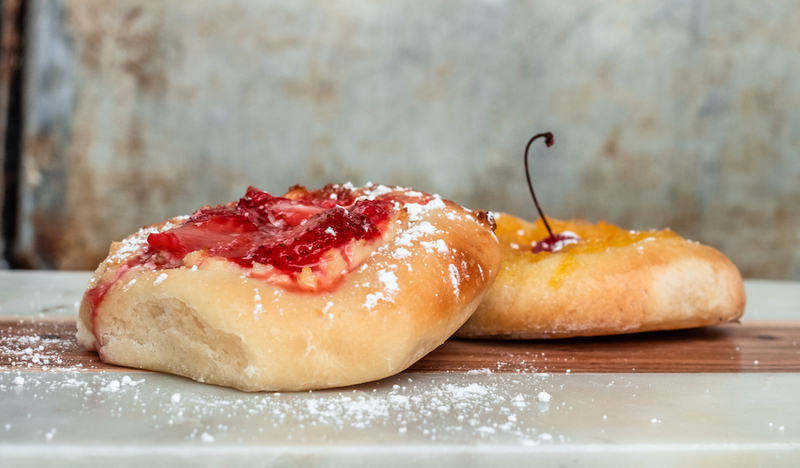 Eating kolaches is a Texan right of passage. Over on Telephone Road, mom-and-pop joint The Original Kolache Shoppe has been cranking out the beloved Czech pastries since 1956. Get the old-school numbers filled with things like poppy seed, sweet cheese, lemon, and raspberry; or go for klobasniky stuffed with the classic combination of sausage, jalapeño, and cheese. While tradition is always great, you’ll also want to check out new-age standouts like Koala Kolache, Hugs & Donuts, and EggHaus Gourmet. Part of the Museum of Fine Arts, Houston collection and housed in the former home of Houston philanthropist Ima Hogg (aka “The First Lady of Texas”) in River Oaks, this picturesque garden and art collection is listed on the National Register of Historic Places. Visit it year-round to feast your eyes on the majestic formal gardens and woodland ravines surrounding the 28-room historic Southern home, as well as the rare masterpieces of American art and antiques that it showcases. Named one of the best Tex-Mex joints in Texas, The Original Ninfa’s on Navigation first got its start in 1973, when Mama Ninfa began feeding locals from a small taco stand. 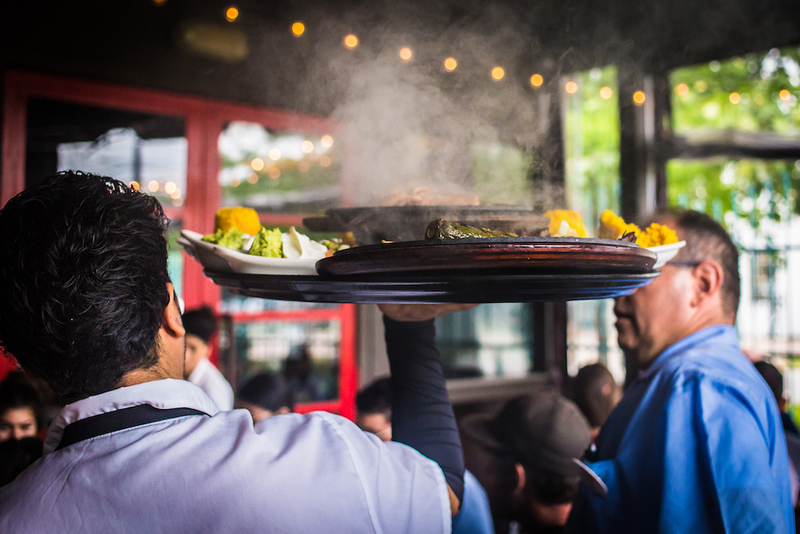 Today, the restaurant is an institution thanks to its addicting outside skirt steak, darkened and served straight from a sizzling hot comal alongside scratch-made tortillas. Accompany your plate with queso, margaritas, tamales and more. 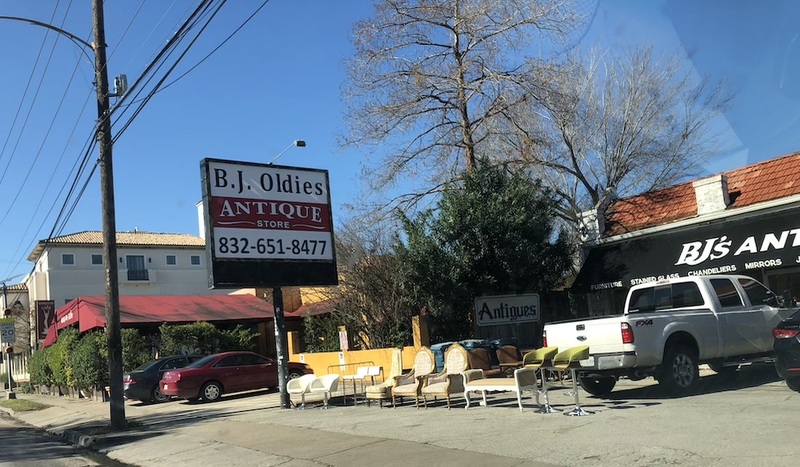 Hit the pavement along the Westheimer Curve and you’ll be treated to treasures untold at its many thrift shops, boutiques, and antique stores. Local staples include B.J. Oldies Antiques, Leopard Lounge, Lo-Fi Vintage, Old Blue House Boutiques, and new gems like Space Montrose. 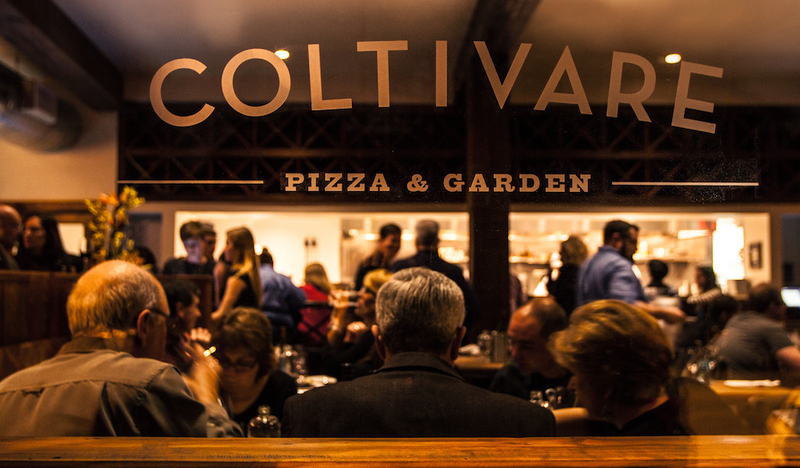 Bustling food halls are taking charge in Downtown. 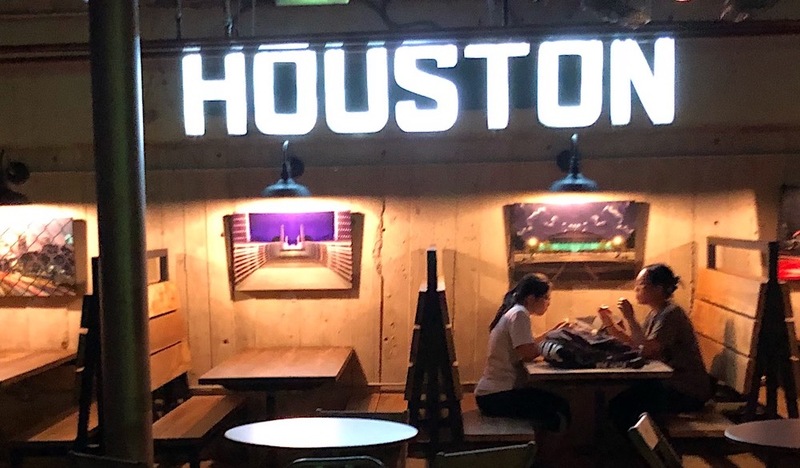 Head to Houston’s first underground beer garden and food hall, Conservatory, to sip craft brews and wines while enjoying eats from artisan pizza and fresh poké to rich pho to decadent tres leches. At the European-inspired Finn Hall, you’ll find a beautiful Art Deco space offering 10 independently operated vendors and two full bars, including an elevated craft cocktail lounge in the mezzanine. And Bravery Chef Hall, open in the new Aris Market Square, offers five chef-driven restaurant concepts under one roof. You can also venture into the Downtown Tunnels for even more underground food offerings; or go outside of Downtown to Greenway Plaza, where the food court is making a splash with cult favorites like Feges BBQ and Burger-chan. 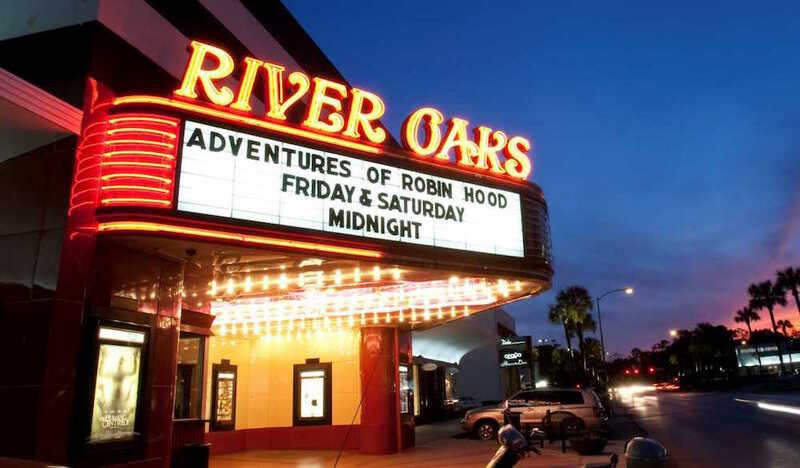 Over in the River Oaks Shopping Center, this cool-looking art deco theater was built in 1939. Hit the grand showroom for the best lineup of independent films and foreign language cinema in town, plus special events like monthly midnight viewings of The Rocky Horror Picture Show. 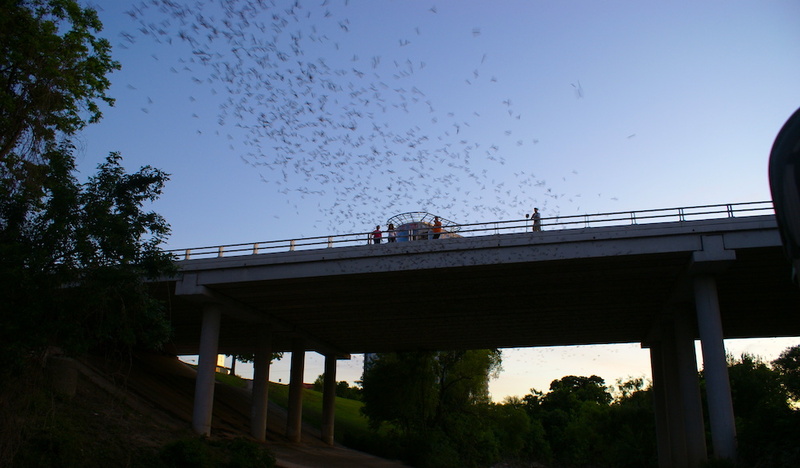 Did you know that after dusk, hoards of Mexican free-tailed bats spiral out from the crevices of the Waugh Street Bridge in Buffalo Bayou Park? It’s truly a sight to be seen (and yes, that is what you’ve been smelling when you run under the bridge). The specific time the bats emerge is not completely predictable (especially after the colony was diminished during Hurricane Harvey), but warmer weather helps. For a unique look at the natural phenomenon, pontoon boat tours are also available. Right on the edge of Sugar Land and Stafford lies one of the most striking man-made wonders in Houston. 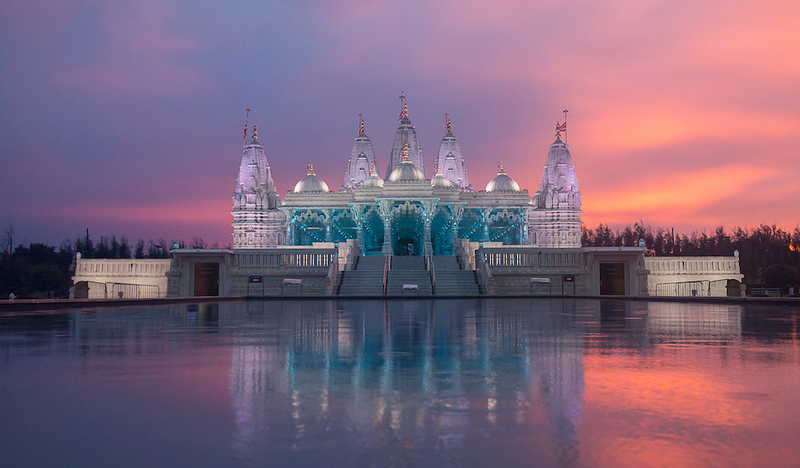 Assembled using 33,000 pieces of hand-carved marble and Turkish limestone that were fitted together like a giant 3D jigsaw puzzle, what really makes the Hindu temple so special is that it was constructed with the help of volunteers in the spirit of seva, or selfless volunteering. Inside, you’ll find a radiant tapestry of art, from Italian marble works to paintings depicting sacred images. If you’re looking for more after your visit, head to Pearland to further sate your spirits at the Sri Meenakshi Temple. Though bivalves are available all year long, the oyster season runs from roughly from September through April. That’s when you’ll want to indulge at these oyster-kissed spots. 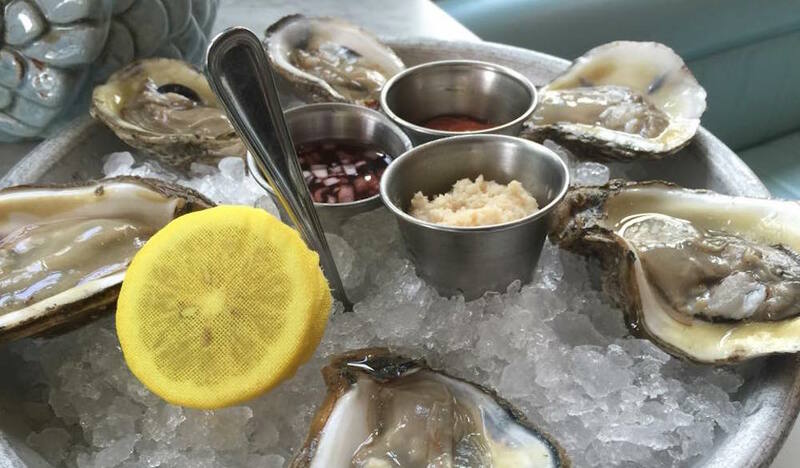 State of Grace has its very own (and very classy) Oyster Room, offering $1 oysters for weekday happy hour. At Caracol, ostiones come on-the-half-shell with salsa bruja and lime, or wood-roasted with chipotle butter and breadcrumbs; and at La Lucha, you can pair the “Gulf gems” with fried chicken (both spots also offer oysters on happy hour). Gulf oysters on-the-half-shell are big and full-flavored with house cocktail sauce, fresh horseradish and cane vinegar mignonette at Field & Tides; while the bivalves come three ways at Liberty Kitchen & Oyster Bar— grilled with bacon jam and jalapeño, topped with garlic butter and parmesan, or served raw on-the-half-shell. And closer to the shore, Gilhooley’s Restaurant and Oyster Bar is known for its decadent roasted oysters oozing with garlic butter and parmesan. 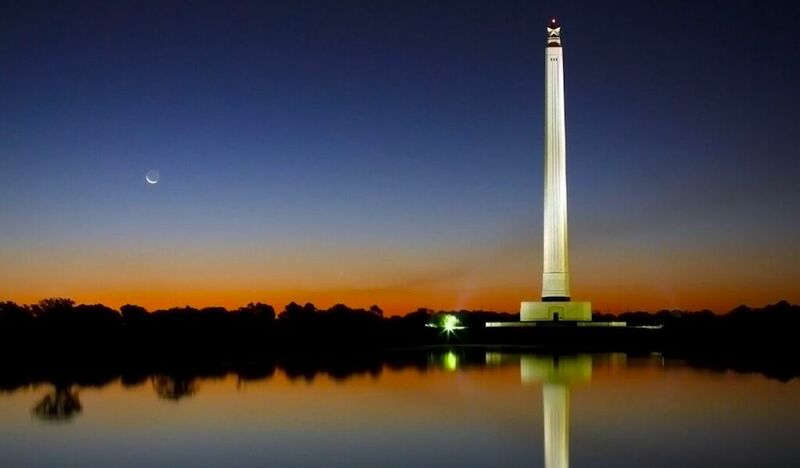 Soaring 570 feet into the air and topped with a 34-foot, 220-ton star, the San Jacinto Monument is the tallest stone column memorial structure in the world. The masterpiece commemorates the Battle of San Jacinto, the decisive battle of the Texas Revolution. Delve deeper into more than 400 years of early Texas history at the San Jacinto Museum of History, located at the base of the monument. Admission to the monument and museum is always free, with special attractions including the Texas Forever! Interactive Experience, Observation Floor, and A Destined Conflict Exhibition available for purchase. And check out our Discover Texas list for even more ways to discover a bit of Texas in Houston, including the Sam Houston Boat Tour along the Houston Ship Channel. Houston gets plenty of flack for its urban sprawl, but look closer and you’ll find plenty of beauty hidden within. That beauty comes in the form of its many iconic murals and public art. Head near Market Square Park to snap a photo in front of the bright and funky Houston is Inspired mural, created by local graffiti legend, Gonzo247; pass beneath the inspiring “Be Someone” graffiti on Southbound I-45 just north of Downtown, or strike a pose in front of the Greetings from Houston mural, a postcard from Houston by prolific muralist and artist Daniel Anguilu located on the east side of Gelazzi in the Heights. Over on Westheimer, the Biscuit Paint Wall is another colorful local fave; and be on the lookout for the 150+ Mini Murals around the city. You’ll also want to check out sculpture artist David Adickes’ larger-than-life works around town, including his We Love Houston sign and regal Beatles statues at 8th Wonder Brewery, as well as his 36-foot concrete cellist Virtuoso at the Lyric Center in Downtown.